First thing First , NCT institute is announcement date in December 2013. Our aim is to provide IT education. To before all to the people of city Jacobabad. 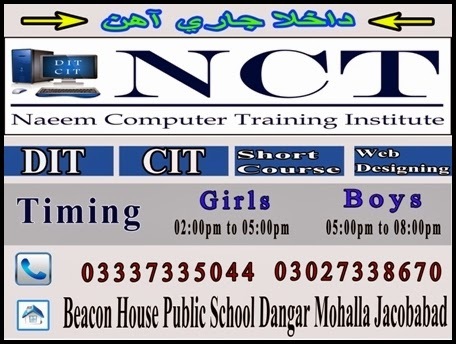 NCT offers one year diploma in information technology. Moreover, CIT ( certificate in information technology) for six months. Likely, we have decided. Because of this place is just only for lack of IT field. Furthermore There is no such a good awareness about computer in this city. No doubt NCT is only accessible way to get in touch. In fact It is only possible through our highly qualified. IT staff to get command and certificate on IT field of computer. Mostly Everyone is expert having good experience and professional teaching techniques for the computer learners. Please to meet our instructor below.